We've always crushed on Viktor & Rolf's offbeat and quirky brand of fashion genius, but we were beyond impressed at the cool web-savvy of their latest runway show. 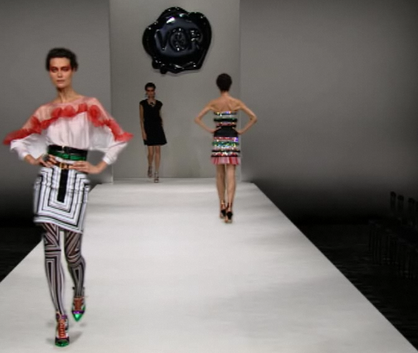 Held in the "Grand Salon" of their website (located atop the showy marble staircase at Viktor-Rolf.com) the virtual runway show for Spring 2009 features Shalom Harlow, Shalom Harlow...and Shalom Harlow. "It was like the fashion Olympics," Rolf (Snoering) explained to WWD about the two-day shoot in Amsterdam, which used multiple camera angles to capture Harlow catwalking in each outfit - five times per look for each of the 20 looks, in heels no less, for 14 hour days (an on-site foot masseur was on hand). A post-production digital magician then compiled all the footage into a music video-meets-traditional runway show, except for the fact that every look on every model is Harlow - in triplicate at various points throughout. For last looks, instead of the models snaking down the catwalk in a single line, each of the Harlows in each of the 20 looks lined either side of the runway, clapping enthusiastically. The collection itself was billed as Funny Face - based on the Audrey Hepburn classic in which she plays a reluctant model who can "think as well as they look." And, as always, V&R clothes do both. A bold flame motif dominated the jewelry, eye makeup and color scheme, along with pinata-esque silhouettes, lantern folds, ruffles, and even a giant white and black nautilus shell to close the show (that Bjork will surely love). Eye candy included three Swarovski-encrusted custom frocks that took a mind-boggling 10 weeks to make. Says Snoering: "We were in the mood for something very hyped-up. The overriding theme is that it's very contrasting and nervous." 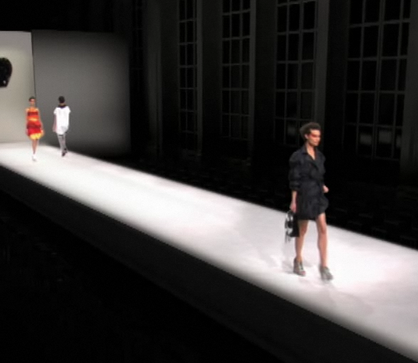 Be sure to visit Viktor-Rolf.com to check out their Spring 2009 runway show. For the rest of our Spring 2009 Fashion Week coverage, CLICK HERE.